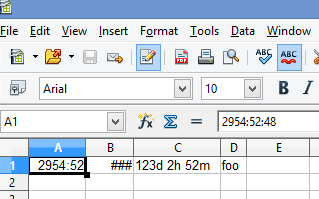 When working with values that are formulas, I am having difficulty getting the columns to autoresize properly. I have "solved" this by making a hidden row that has maximum values as constant strings values, but that is far from elegant and often requires evaluating the formulas in each cell to get the largest strings that are generated. While this kind of works for such a small spreadsheet, it becomes very impractical for sheets that are ~16 columns x ~6000 rows. The following code renders as in OpenOffice. I tried several of the fonts listed with that loop, and while OpenOffice changed the font, the columns where still sized incorrectly. The reason is autoSizeColumn sizes your cell based on the cached formula evaluated results and if the formula was never evaluated, it would not know what size to set for it. Where to put autoSizeColumn in Apache POI? How to store CellStyle object into database?